By Capt. Sammy Ray Woodburn Sr. There was a three star surprise awaiting JROTC students of Jersey Village High School in Houston, Texas in December, when they found the commander of 20,000 American Soldiers waiting to talk to them. 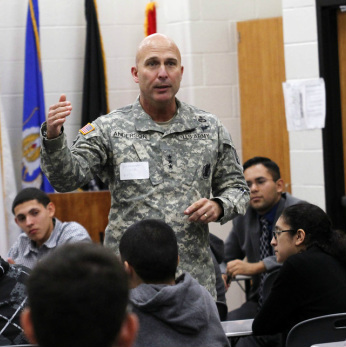 Lieutenant Gen. Joseph Anderson, commanding general of the XVIII Airborne Corps and Fort Bragg, N.C., was in Houston that month for an engagement and asked to speak with a high school class. Anderson asked the class for their thoughts on topics such as gun control, universal health-care, leadership, their plans after high school, and what it takes to be successful in life. Staff Sgt. Christopher Buys, a recruiter in Houston’s North Recruiting Company who works with and mentors students at the school, coordinated the event. Principal Ralph Funk said the students and staff truly enjoyed the general’s visit. and world for many of our students,” Funk said. Anderson concluded the visit by presenting certificates to a few of the students selected by Junior Reserve Officer Training Corps (JROTC) instructor Air Force Maj. (Ret.) Dennis Martinez. School representatives presented Anderson with a certificate of recognition and made him an “Honorary Falcon” at the high school.